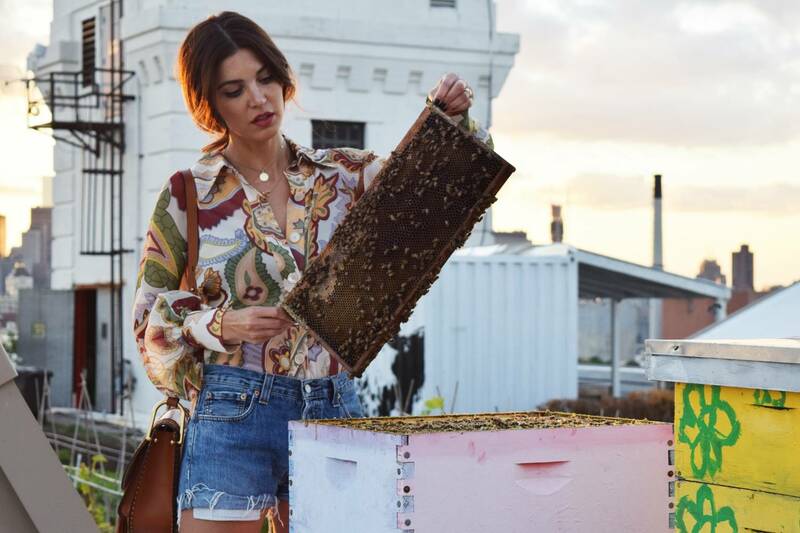 During last season’s NYFW, Negin Mirsalehi had the opportunity to mix two of her passions: Fashion and beekeeping. At the most inspiring location you could ask for as a beekeeper, she felt right at home. Immersing herself in this thriving natural environment built on top of a metropolis like New York, Negin could feel the warm and nurturing energy associated with this particular space. In between a hectic NYFW schedule Negin was determined to make time to visit a special place she had discovered on the internet; a rooftop named The Brooklyn Grange. It’s the world’s largest green roof farm, which includes a lot of beehives. During NYC Honeyweek, an annual educational and entertaining festival celebrating the honey bee, Negin teamed up with this unique bee farm to fashionably capture her deep affection for beekeeping. Together with Chloé, one of Negin’s favorite fashion houses, they arranged a photoshoot on the Brooklyn Grange. Overlooking the Manhattan skyline, the setting was utterly magical. Mastering her beekeeping skills at twilight—it doesn’t get better than that. As online influencer and beekeeper, Negin Mirsalehi is really excited to combine these two passions more often in future endeavours. Beekeeping has been in the Mirsalehi family for six generations, so it was a remarkable experience to collaborate with Chloé to express her vision. Be inspired by the bee-special photoshoot and check the photos below. Also, make sure you check out the Instagram of NYC Honeyweek, the Brooklyn Grange and Chloé.